Windchaser Grand is a bright, modern villa with a welcoming design and plenty of lounge space. I love how you can relax by the pool, on the balcony, in the common area, or in your private bedroom lounge. If you want a break from relaxing, Long Bay Beach is a short walk away. You can definitely sunbathe and snooze on the sand, but this is also the island’s hot spot for kiteboarding, kitesurfing, and water sports. 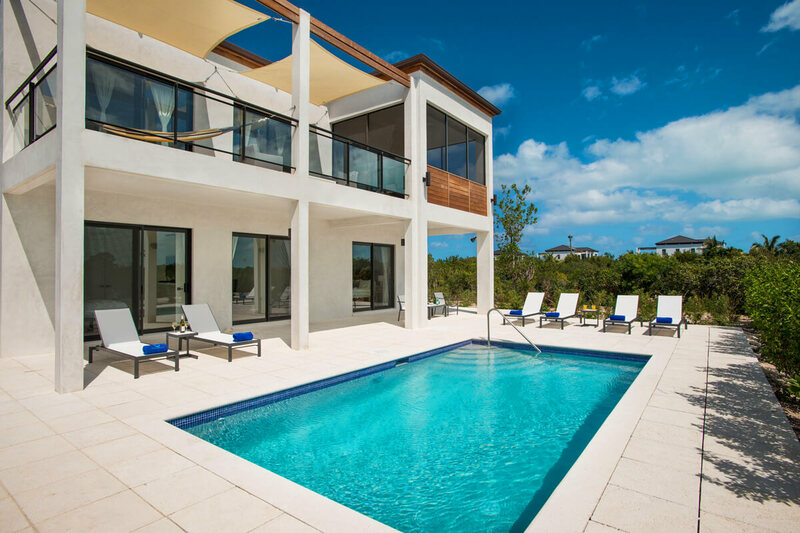 Modern villa near Long Bay Beach! Windchaser Grand blends informal luxury with a beachside location near Long Bay Beach. This elegant villa’s architectural design takes advantage of the ocean views and lush, green surroundings. The pool deck and balcony provide ample space to relax in the shade and sun. The pool is surrounded by loungers and a breakfast nook, while the balcony has a hammock and living area. Dining al fresco is great, but it’s even more enjoyable in Windchaser’s screened balcony. For days by the sea, follow the villa’s private road to the heart of Long Bay Beach, which offers three miles of pristine, white sand and warm, turquoise water. Guests at Windchaser also have exclusive access to the surrounding grounds and tennis court. Open plan interiors combine with bright, neutral color schemes and walls of sliding glass doors. The living room features a flatscreen TV, ocean views, and a sound system. The adjacent kitchen opens to the living room and has stainless steel appliances, a breakfast bar, and a coffee maker. All four bedrooms have ensuite bathrooms and sliding glass doors that lead directly to the pool and lounge area. The first bedroom has a king bed and the other three bedrooms have two twins that can be made up as a king. Two of the bedrooms also have their own kitchens and lounge areas. There are three pull-out couches to accommodate younger guests. Long Bay Beach is the perfect location to unwind and enjoy water sports such as kiteboarding, kayaking, and sailing. Walk five minutes along the beach to The Shore Club to enjoy their bars and fine dining restaurant, or go to Grace Bay’s fine restaurants, beach bars, and activities. 3-4 minute walk to Long Bay Beach from villa. Upon arrival at the airport, guests will secure a rental car and drive to the villa using the directions provided.